Is it evil to put peanut butter on your 10-year old’s flip-flops if she leaves them under the couch in hopes that the dogs will come along and tear the flip-flops into shreds? I didn’t do it, but I sure thought about it last night when I saw that Kayla had chunked her flip-flops off and slid them under the sofa rather than returning them to her room. I hate flip-flops with a purple passion. FN. They really serve little purpose, except on the sand at the beach – in regular wear, they provide no protection or support for the feet, and they certain don’t aid the wearer in any appreciable manner. They are uncomfortable to wear, prone to fall off at the most inconvenient times and do not even keep your feet clean. I especially hate flip-flops on my daughter, because they keep her from walking fast enough to keep up with us, and when she runs in them, I have visions of her blowing them out in a spectacular fall down the driveway that winds up in a trip to the emergency room. And the sound! The shuffle-plop of the flip-flops as she walks beside me starts to send the same kind of shivers up my spine as fingernails on a blackboard after no more than five minutes. She, of course, loves them. We used to try to ban flip-flops entirely, but that strategy, due to the various interventions of sundry grandmothers who shall remain nameless (until my grandmother died a year and a half ago, Kayla had four grandmothers! ), didn’t work out, so we achieved a compromise – Kayla gets one pair of flip-flops to wear for a summer. If that pair gets destroyed somehow, then she has to do without, buy her own replacement pair, or wait until a grandmother takes pity on her once again. So I ask again, is it evil to put peanut butter on your daughter’s flip-flops in order to entice the dogs to destroy them when the flip-flops have been left out under the sofa? This entry was posted in Child's Play, working mom and tagged daughter, dogs, Flip flops, humor, parenting, shoes. Bookmark the permalink. Unfortunately Nancy, I think every kid and I will even go further than that, every college kid has flip flops. Most adults have them. 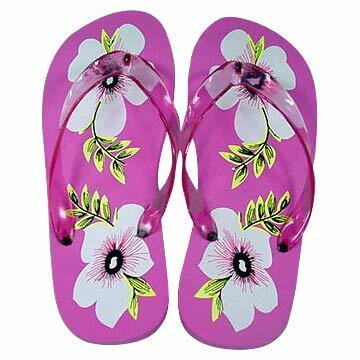 So, poor Kayla will be one of the few missing out on the “flip flop” experience when hers are eaten by the dogs. What is easier than sliding on a pair of flip flops when going to the grocery store, outside to the garden, to the mailbox, to Wal-Mart, to bum around..
Mandy and Darwin love flip flops, too, for the same reason you do!